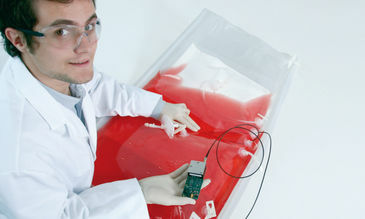 The electro-optical module EOM-pH-mini is a precise OEM solution for non-invasive pH sensors. Assembled according to ISO 9001 they deliver certified quality. In addition, validation and customization of the integrated software is offered. Bags and single-use bioreactors are in the process of revolutionising the way biopharmaceuticals are manufactured. Our non-invasive pH sensors are the tools to make the cultivation vessels fully disposable. As non-invasive DO sensors are also available, the two key parameters oxygen and pH can be controlled online. Sampling rate Below 1 sec. What is the time of delivery?